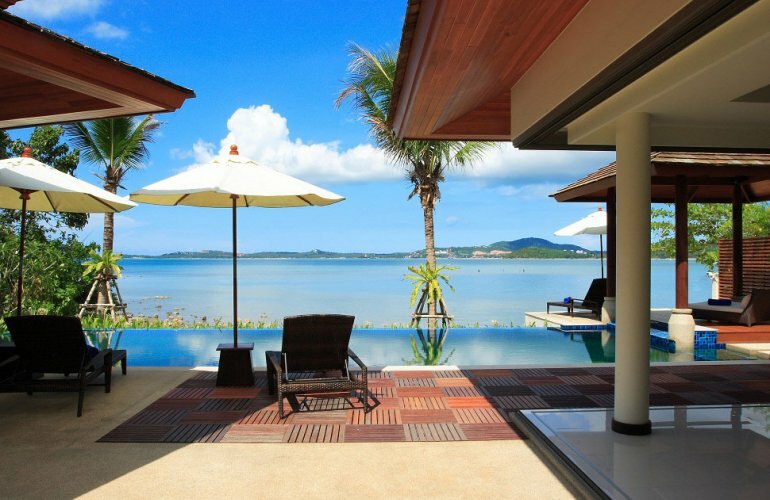 A stunning beachfront villa in a prestigious residential community in Bophut, on Koh Samui's northeast coast, this luxury holiday property is just ten minutes from the island's airport and is also close to first class restaurants and shopping opportunities. This exclusive estate at Bophut Bay offers its guests understated styling teamed with modern facilities, all situated on a beautiful beachfront on the northern coast of Koh Samui. The villa is secluded and private, and offers a high level of security. It is decorated in clean and simple lines, with white walls and contrasting colours in the luxurious fittings, furnishings and accessories. The full length folding doors in the living rooms allow walls to open completely to make this a very comfortable and cool environment, but should the need arise, the living, dining and all the bedrooms are air conditioned. There is a plasma TV in each of the four bedrooms, together with DVD/CD players, a satellite TV/DVD/CD system in the living room, and a Hi-Fi with outdoor speakers. Complimentary Wi-Fi broadband Internet access is provided for guests' use. After entering the villa through its grand entrance, on the left are two elevated bedrooms that have the most spectacular sea views, making this villa unique compared with others on the estate. The large master bedroom has a white voile draped four-poster king-size bed, a small sitting area and a sizeable en suite with bathtub and shower. It has stunning views over the lower level of the villa towards the ocean. But all the bedrooms in this stunning holiday villa offer soothing views and a tropical beachside ambiance. The second and third en suite bedrooms have double beds, and the fourth has twin beds. All bedrooms have a personal safe. Continuing through the main pathway towards the front of the pavilions the ground level consists of a private parking area and a large courtyard garden. At the front and to the right is the spacious and relaxing living pavilion, comfortably furnished for relaxing or watching the television, reading or listening to music. There is a large decked area between the living room and the kitchen/dining pavilion, extending out to the swimming pool. This is equipped with sun loungers and parasols for soaking up both sun and views, or just lying in the shade and relaxing. The blue-tiled and infinity edge pool is perfect for cooling off, and is large enough for laps. The sala at one end of the pool is the perfect spot for enjoying a sundowner cocktail pre-dinner, or indeed for a home-cooked evening meal. The pavilion opposite is the combined kitchen and dining space. Here a fully fitted and western style kitchen is to the rear of the area, separated from the dining room by a handy breakfast bar with stools. The large dining table can accommodate up to ten guests. Stand-by power silenced generator unit housed away from the property.